Under Jocelyn’s tutelage, the 18 students who are participating in the More Than a Game program are engaging in various leadership roles, including serving as team captain and in leading team huddles. In particular, one Eagle Rock School student has been named manager of the team (that student is responsible for assisting Jocelyn during practices by managing the clock, setting up drills, and making sure all students are aware of upcoming trips), while two other students were named team captains — roles that offer equally unique opportunities for leadership, including holding team meetings, leading select practices, and communicating with Jocelyn and the team manager. As a result, the two team captains work to hold their teammates accountable on the court, in classes, and even in the Eagle Rock community. Through participation More Than a Game, students are learning the skills that not only make them successful basketball players, but also successful students — with athletes assured that their education comes first. How does Jocelyn do this? By ensuring students practice accountability and communication skills during weekly lunch meetings and by attending practices. Most practices take place on our regulation-size basketball court within our 22,494 square-foot on-campus Human Performance Center. There, students divide up into several teams for friendly but meaningful competition. In addition, there have been several staff versus student games. 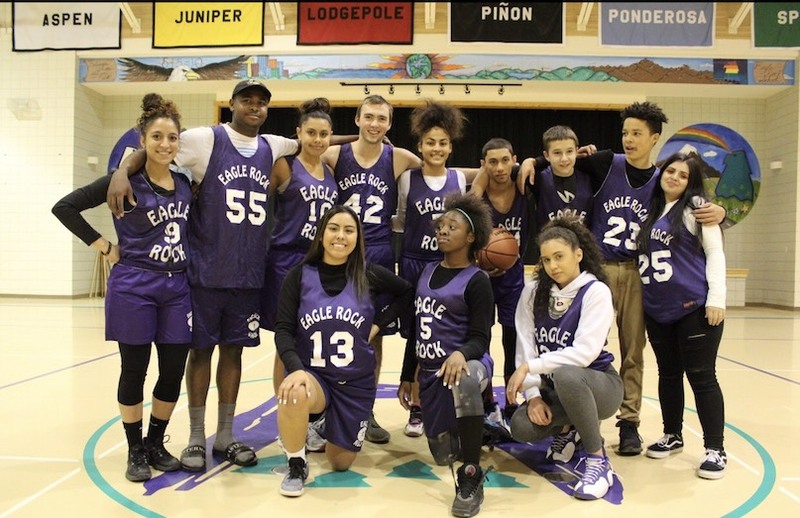 And after a recent Eagle Serve activity, our players competed against Estes Park High School in a pair of pick-up games. Not only are our athletes accountable to themselves and to each another, but to their teachers and Eagle Rock house parents as well. There is continuous communication to ensure that all program participants remain healthy, complete their school work, and continue to be productive citizens within the Eagle Rock community. The emphasis of the program is to give students the insights and knowledge necessary to become team players, as well as learning how to be leaders — a skill that not only contributes to success on the court and in the classroom, but in their personal lives as well. As for the immediate future, Jocelyn will be interviewing participants for two slots to attend the Sports Challenge Basketball Camp this summer at Haverford College in Pennsylvania. Those students will bring back new basketball and life skills to share with our on-campus community. In addition, coaches from the University of Denver Women and Men’s basketball teams will be visiting Eagle Rock later in the trimester to meet with our students and discuss what it takes to play a sport on the collegiate level. This entry was posted in Life at Eagle Rock School and tagged Basketball, Haverford College, Jocelyn Rodriguez, Sports Challenge Basketball Camp, University of Denver.